What’s new in organic skincare for this holiday season of 2016? Medical herbalist and skin expert at The Walsingham Natural Health Center in Turo, Italy, Dr. Mariano Spiezia has been considered the father of the organic beauty movement in Britain and was voted one of the Top 25, “Who’s who in natural beauty” in 2012 and 2013, 2015 and again in 2016. Dr. Spiezia graduated in Medicine and Surgery in Italy in the early 1980s, and has since worked on combining orthodox medicine with the extraordinary power of nature. For years Dr Spiezia has studied these connections with the idea of empowering the ingredients he uses with a higher frequency to gain a positive resonance on people’s skin and overall health. The result of this research is the Bio-lipophilic Matrix®, which is now at the core of each individual Inlight skincare product. The Bio-lipophilic Matrix® consists of a specific blend of pure organic, cold-pressed oils selected for their high bio-chemical affinity to the lipidic human skin layer. Prior to production, they are energized by Dr. Spiezia’s bespoke techniques, which combine ancient traditions with modern science. These techniques heighten the oils’ vital force and help re-attune the skin to harmony, health and beauty. 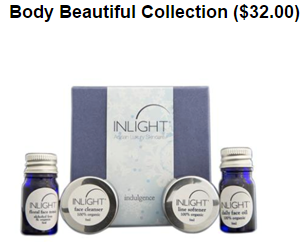 This enhanced blend of oils forms the heart of every Inlight product. The core feature of Inlight’s formulations lies most importantly in the synergy between the individual ingredients. Other key factors are Dr. Spiezia’s medical expertise and Inlight’s carefully designed manual production, including its herbal oil, the base of all INLIGHT products, obtained by infusing the selected herbs in oils. The resultant herbal oil is extremely rich in beta-carotene, antioxidants, and pigments such as chlorophyll. Entirely Plant Based, Inlight Skincare is suitable for vegetarians and Inlight oils are suitable for vegans. In addition, all Inlight products are microbiologically and nickel tested in the high tech labs of the Centre of Homeopathic Medicine in Naples (CeMON). Inlight proudly displays the BUAV accreditation to demonstrate that none of our products or their ingredients has ever been tested on animals. Inlight packaging is all recycled (glass jars up to 98% recycled), recyclable or biodegradable, and Inlight only uses vegetable-based inks. Even maize filler is GM free and will biodegrade over time. Inlight stunning eco-glam boxes contain no extra insert, everything we want you to read is printed on the beautiful interior. Just open the glue-free box and enjoy reading! Every new material is subject to intense scrutiny to ensure we make the best environmental choice. The use of plastic is minimal, and strictly where no realistic alternative exists. Where possible a recyclable plastic is selected (eg. our ointment labels). Inlight re-uses packaging wherever possible. Nothing is wasted, even herb pizza, left at the end of a production cycle, is fed to the cows on Roskilly’s organic dairy farm where Inlight has a workshop. Inlight recycles or composts all office waste, including print cartridges and tea bags. Inlight turns off electric appliances whenever possible. All but one of Inlight's team walks to work. This essential trio of products (in miniature sizes) to cleanse, tone and moisturize for beautiful, radiant skin. Face Cleanser 0.17 fl. oz. Daily Face Oil 0.17 fl. oz. Cleanse, tone and moisturize with this essential Inlight trio, offering your skin just the right nutrients to keep it well nourished and silky soft and smooth. 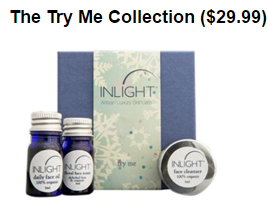 Make Inlight part of your essential daily regime and see the difference for yourself. The cleanser and reviving tonic will delicately cleanse away impurities, whilst the Face Oil soothes and moisturizes and the sumptuous Line Softener, combining 20 different bio-actives, works to plump and hydrate with extra concentrated care. Line Softener 0.17 fl. oz. Embracing the whole body from top to toe, our deeply warming Body Oil will rejuvenate, promoting suppleness and elasticity, whilst its partner the Firm & Tone oil with its high concentrations of active plant oils and astringent plant extracts will leave skin toned and smooth. Restorative Body Butter will pamper, soothe and replenish the skin with its rich formulation and our exquisite Foot & Leg Balm is the perfect answer to revive tired, aching feet and melt away dry, rough skin. How to use: For the most beneficial effect, apply each of these products after a warm bath or shower when the skin is relaxed, warm and can readily absorb their bio-active nutrients. Massage gently into the appropriate area for long-lasting moisturizing effect.